Our reflective dog safety collars combine highly reflective material with leather and instantly make your hound visible to oncoming traffic from as far as 300m away. By reflecting light from vehicle headlamps a reflective dog collar worn on early morning, evening and night time walks makes you and your dog visible to oncoming traffic on dark roads and pavements. Wearing reflective collar and reflective accessories in low light conditions can sand does save lives. Be safe! Be bright! Be seen! Be wise! 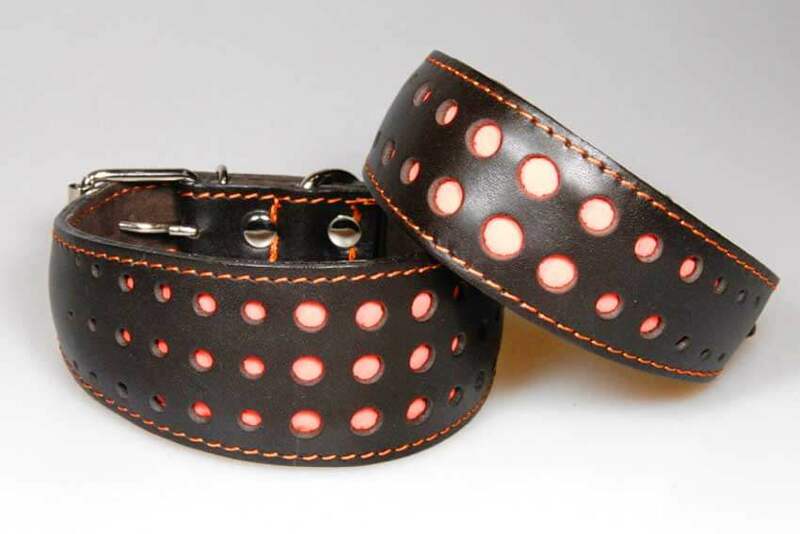 Dog Moda's sighthound shaped reflective leather collars are fully padded and lined leather for your hound's ultimate comfort. To our initial black collar with silver reflectives we have now added a new colour combination - brown collar with orange reflective material.